When selecting window treatments for your home, think Bravo Aluminum Privacy Mini Blinds.These window blinds are compromised of long, horizontal 1" slats. The mini blind slats can be made to open or close through an attached rod.The benefits of Bravo mini blinds are numerous. Bravo Aluminum Privacy Mini Blinds are the perfect choice for blocking out light and protecting against the damaging effects of direct sunlight exposure, which includes fading of furniture, carpetting and hardwood floors. As well as limiting sun exposure,Bravo Privacy Mini Blinds provide the perfect amount of privacy from neighbours or passerbyers. Bravo Mini Blinds provide you with the optimum room temperature. In the summer, mini blinds keep your house cooland pleasant during those long, hot summer months. As well as in those cold winter months, they prevent warm temperatures from escaping through your windows and doors.Therefore, less cooling with air conditioning and fans is needed in the summer and increasing the heat in the winter, which results in a bigger savings to you. 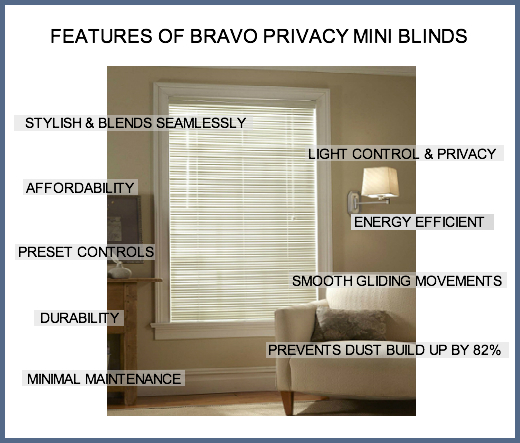 Bravo mini blinds decrease your energy bills, thereby saving you valuable money. 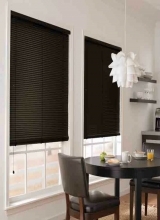 Privacy mini blinds are another incredibly popular choice of window fashion. They are simple, stylish and affordable. The feature that sets them apart from traditional mini blinds is that their slats can be tilted up over down with a wand. The tilting of the slats allow you to adjust the amount of light entering as well as the amount of privacy desired. Adjusting the slats to reduce the amount of direct sunlight and damaging UV rays that are harmful to your home or office furnishings. Available in many colors and provide a stylish and contemporary look. They blend seamlessly into the background. This product is constructed from sturdy and durable aluminum that ensures longevity due to its wear and tear ability. Require minimal maintenance and can use a duster or vacuum cleaner attachment to clean. They are ready-made to install and take only a short time before you are enjoying all their benefits. As opposed to drapes, this product does not touch the ground and therefore, is not a temptation for small children or pet to play with them. Their pricing makes them an affordable option that allows you to cover every window in your home. © Copyright 2019. Bravo Blinds.